un\ in\@n\ [email protected]\ p#w\wk vW mEU ayQn..
ek am|mn\[email protected]\ vQwrk\ k`NE kt..
arQmQn\ g[ kryQ [email protected] qEp\pw\ nQm|n..
උන් ඉන්නේ බයේ පැත්තක වී මුළු අයින..
එක අම්මන්ඩියෙක් විතරක් කාණු කට..
අරිමින් ගඳ කරයි අපෙ දුප්පත් නිම්න..
hrQ hrQ [email protected]\ pQs\sEq @m| krn\@n\? @m`n` klw\ apQ [email protected] kQyn\@n\..
[email protected]\ kvQy @p`dQ "vLQyk\" n#@w`w\ [email protected]\..
gwQyk\ a#q\q f#n\tsQ nQm|[email protected]\ [email protected]\..
හරි හරි අනේ පිස්සුද මේ කරන්නේ? 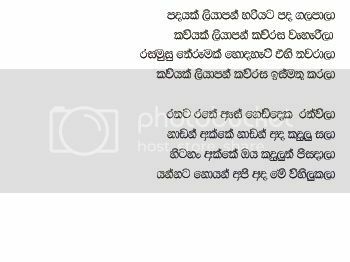 මොනා කලත් අපි අපිමනෙ කියන්නේ..
කවියෙන් කවිය පොඩි "වළියක්" නැතොත් අනේ..
ගතියක් ඇද්ද ෆැන්ටසි නිම්නයේ අනේ..
@kLQ mQn\ pQs\sE m kt h#kryQ lE..
කෙළි මින් පිස්සු ම කට හැකරයි ලු..